Dell Latitude 10: Viable Healthcare Tablet Option? 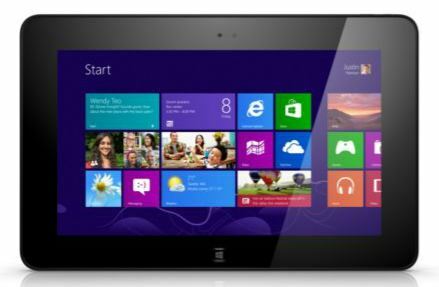 I just read a fascinating article in the Healthcare section of InformationWeek by Ken Terry entitled “Dell Targets Healthcare with Windows 8 Tablet.” The basic premise behind the story is that because the Latitude 10 offers some key security features and a lower TCO than an iPad, it stands some chance of competing head-to-head with that favorite of Apple devices. Could the Latitude 10 really beat out the iPad for healthcare professiona use? The Latitude 10 includes only a dual-core Atom Z2760 1.8 GHz CPU with 2 GB RAM (not expandable) — it does run either 32-bit Windows 8 or Windows 8 Pro, however. I’m not sure that this will give healthcare professionals enough horsepower to do everything with their tablets that they might want. There’s not a lot of EHR infrastructure for Windows machines yet, either, nor is there much emerging for the Windows 8 platform at the moment, either. Dell’s purported advantages do require application (and app) support to help further bolster their case. All of this said, I find Terry’s case for the Latitude 10 as a possible healthcare tablet at least interesting, if not intriguing. I wonder if the IT and purchasing folks at any of the major healthcare providers are seriously pursuing this platform as an option…a detail that Terry’s story unfortunately fails to address. I presume the sales cycle for such a deal is underway, possibly at several providers, but methinks if any deals were done or in the offing they would have been mentioned here (or in some Dell press release somewhere). The most obvious shortcoming is the lack of thick rubber corner bumpers. For any device intended for industrial use, it is highly likely that it will be dropped at some point. A stylus would be useful too considering medical professionals often have to wear nitrile gloves which may not be sensed by the touchpad. Anything could be considered a viable option in healthcare today given all the money Obama's spending on making us healthier, no? It's funny, I remember when the Palm and similar PDAs came out back in the late 1990s and evolved in the early 2000's. They were all the rage in healthcare: "Look at what we can do to improve patient care, telemedicine...blah, blah, blah". Since then, I've unfortunately spent a lot of time in the ER as well as in oncology and cardiology offices helping tend to sick parents and have seen very minimal adoption of tools like this tablet. I think such technologies would be wonderful for healthcare given their utility and security features - especially for those HIPAA covered entities who've learned the hard way that their Notice of Privacy Practices ≠ HIPAA compliance. It'll be interesting to see how healthcare IT evolves in the next decade. Hopefully it'll be for the best.